The Kalachakra Mantra symbol of Buddhism is comprehensive and complex. The word kalachakra signifies cycles of time, and the Kalachakra system presents 3 such cycles: internal, external and alternative. The internal and external cycles deal with time as we commonly know it, while the alternative cycles are practices for gaining liberation from these internal and external cycles. It is also referred to as the „Tenfold Powerful One”. Hence, it is named because it consists of 10 distinct parts. This ancient sacred symbol is made up of a mantra of 7 syllables surrounded by a ring of fire. Above and to the right and left of this potent mantra are 3 additional symbols, hence, totaling 10 parts of the design. The symbol’s many parts are interconnected with each other to form an elaborate pattern. In addition, the Sanskrit word Kalachakra signifies „time wheel”. This ancient symbol basically represents the entirety of the 2,500-year-old Kalachakra tantra that is chanted in an effort to purify the mind and body. This powerful and efficient tantra is all about time, such as: the cycle of our own breath, the cycles of the planets and the various cycles in our bodies and lives. 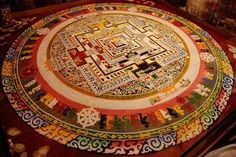 Today, Kalacakra is practiced by all schools of Tibetan Buddhism, although it appears most prominently in the Gelug lineage, which is the newest of the schools of Tibetan Buddhism. It is the main tantric practice for the Jonangpa, whose Tibetan Buddhism school persists to this day with a small number of monasteries in Qinghai, Kham and Sichuan. Efforts are under way to have the Jonang tradition be acknowledged officially as the 5th tradition of Tibetan Buddhism. The first part of the mantra, „Om Ah Hum Hoh” signifies the speech, body, mind and wisdom. These four sacred syllables are reputed to be able to cleanse the body and mind in one’s efforts to achieve enlightenment. Ya (black) means the element of air. This entry was posted in Buddhist Mantras on March 2, 2016 by admin.